Mumbai : Big FM launched audio entertainment show Muthoot Blue ‘Dhun Badal Ke Toh Dekho With Vidya Balan’ presented by Muthoot Fincorp. The debut of this versatile actress as a radio jockey has been the talk of the town. 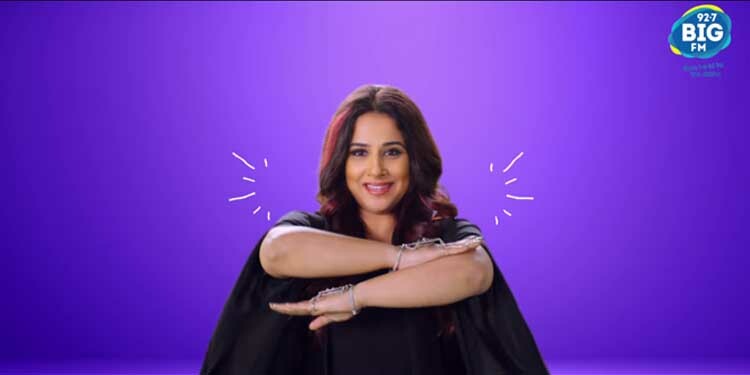 Fueling anticipation comes the highly-awaited rap video, which Vidya Balan has sung herself for the first time for her radio show with BIG FM. In the video of this rap song, the superstar can be seen rapping for the very first time and slaying with confidence. The show that went on-air on 25th March,airs every weekday evening from 7 PM to 9 PM, with repeats on Saturday and Sunday from 5 PM to 9 PM across HSMs. A special highlights segment named Muthoot Blue Dhun Badalke Toh Dekho with Vidya Balan – SPOTLIGHT, will be aired across Monday to Friday between 01:00 PM to 02:00 PM. Keeping in mind the essence of the show which aims to bring imperative social topics to the forefront, the rap by the actress highlights the stereotypical mindset and touches upon challenges which are still not widely discussed in the society. The rap encourages people of the nation to open-up and participate in positive conversations about social challenges and issues like the pressure of looking good on social media, ego issues amongst couples if the woman earns more than the man, mental illness, and superstition among others.